Gameplay do jogo Mario Kart Mania Wii 2018 (by Charly Retro), hack feita com base no New Super Mario Bros. Wii do Nintendo Wii. 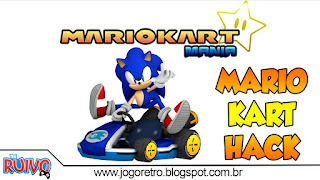 O jogo Mario Kart Mania Wii traz diversas novas pistas, além de alguns circuitos clássicos remodelados. Os personagens disponíveis são: Mario, Luigi, Princess Peach, Yoshi, Toad, Donkey Kong, Bowser, Daisy, Waluigi , Dry Bones, Baby Daisy, Baby Luigi, Birdo, Bowser Jr., Diddy Kong, Dry Bones, Dry Bowser, Funky Kong, King Boo, Rosalina, Toadette e Sonic the Hedgehog.